Wilhelm “Wim” Johnen was born on 9 October 1921 at Homberg in Niederrhein. In June 1941, Johnen was posted to NJG 1. Leutnant Johnen was assigned to 3./NJG 1. He gained his first victory on the night of 26/27 March 1942, when he shot down a RAF Wellington twin-engine bomber. He then attacked a RAF Stirling four-engine bomber but his Bf 110 D-3 (W.Nr. 4224) “G9+FL” was hit by return fire from the bomber’s gunners killing his crewman and wounding Johnen in the left leg. Johnen managed to bale out of the burning aircraft. He was to spend a considerable time in hospital for treatment to his burns and wounded leg. He returned to combat duty in July 1942. On 1 October, 3./NJG 1 was redesignated 1./NJG 5. In December, 1./NJG 5 was redesignated 5./NJG 5. Johnen recorded seven victories during 1943. In January 1944, he added a further seven victories, including three RAF Lancaster four-engine bombers on the night of 27/28 January to record his 13th through 15th victories. He downed a further three Lancasters on the night of 15/16 February (16-18). On 3 March 1944, Johnen was appointed Staffelkapitän of 6./NJG 5. On the night of 27/28 April, Johnen shot down a RAF Lancaster four-engine bomber. He and his crew then made contact with another over Lake Constance heading west for Switzerland. Johnen attacked the Lancaster but his Bf 110 G-4 (W.Nr. 740 055) “C9+EN” received hits in the encounter setting the port engine alight. Coned by Swiss searchlights and with a dead engine Johnen was obliged to land at the Swiss airfield at Zürich-Dubendorf. Johnen and his crew were interned only to be repatriated some days later amid much political manoeuvering. Johnen was appointed Staffelkapitän of 8./NJG 6 on 10 May 1944 based in Hungary. In a little over two months, Johnen added 11 victories to his tally, including four Russian Mitchell twin-engine bombers. Oberleutnant Johnen was awarded the Ritterkreuz on 23 July for 33 victories. In autumn 1944, Johnen was appointed Gruppenkommandeur of III./NJG 6. He led the unit until the end of the war. Post-war, Johnen attended university and gained an Engineering degree. In 1952 he worked with Professor Willi Messerschmitt before taking up construction engineering, successfully running his own business. Johnen died on 7 February 2002 at Überlingen. 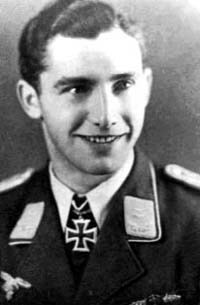 “Wim” Johnen was credited with 34 victories in over 200 missions. All his victories were recorded at night. Included in his victory total are 24 four-engine bombers.